Julian & Rasta (VIP mentor programs) .-. CLICK HERE to book your free 20 minute video call consultation as mentioned in the podcast. In this podcast episode we jump into the Animal Training Academy trenches and talk to a member who has been involved in a VIP mentor program for the past 5 months. Julian has a companion Alexandrine parrot called Rasta and since joining Animal Training Academy has been on an odyssey of learning and growth. Julian shares his experiences in this podcast episode and talks about some of the biggest things he has learned along the way. 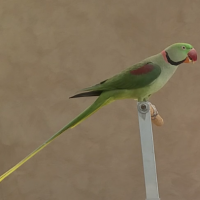 3:18 The importance of doing your research and putting careful consideration into a decision to welcome a companion parrot into your family/life. 9:36 Julian Shares some of the most eye opening experiences that he has had since starting to learn about positive reinforcement animal training and Applied Behavior Analysis (ABA). 11:37 Julian uses his experiences to relate to people who might be thinking that positive reinforcement won’t work for them. 12:59 Julian talks about his experiences and the value that he has found in filming his training and watching it back.